What a weekend! I returned from our latest Boy Scout backpack trip yesterday and I'm still a little stiff from the trip. As I mentioned our goal was Mt. Pinos (ele. 8,847 feet) near the Chumash Wilderness Area in Ventura County. This was to be a training hike building the boys up for more difficult hikes later this summer. 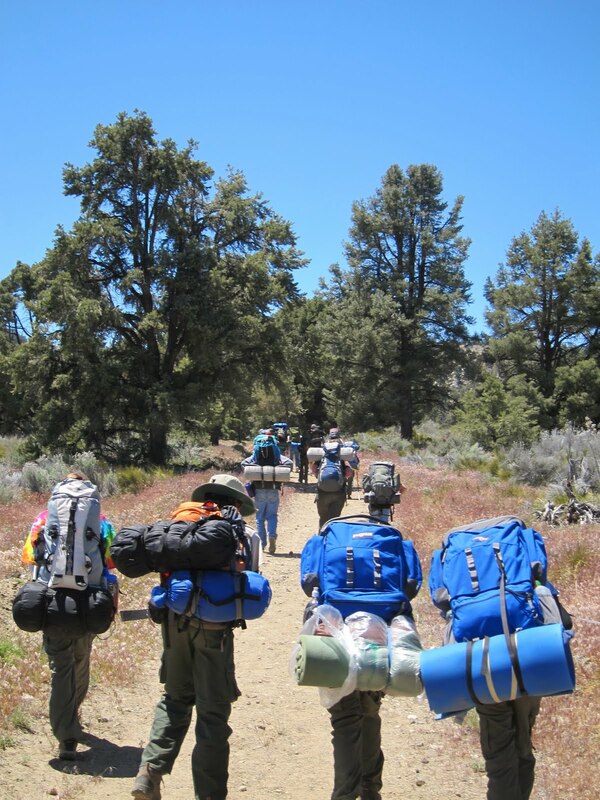 For several of our Scouts this was their first time backpacking. Things started off rather normally. We hiked, slower than expected, to a place called Lily Meadows (6,250 feet) where we had a small amount of unexpected snow the first night. Not expecting worse, we pressed on to Sheep Camp (a little over 8,000 feet) where we encountered an unexpected storm. We were hit with snow pellets and strong winds. It was at this point that we abandoned the idea of reaching the summit. I slept in a little 1-man tent and the winds were so strong I placed large rocks on top of the tent stakes, but during the evening two of the stakes were ripped from the ground. While we didn't expect the storm, we're Scouts and well prepared for unexpected situations. Although I must admit, I felt a bit like an arctic explorer that night with the wind and snow whipping my tiny tent. The next morning all was better and it even warmed up hike home in a t-shirt. What an odd and fierce little storm. I went up to the ridge line to look at the view, which would have been close to what we would have seen from the top. All the boys had fun and made it home safe, which is the real measure of a good trip. What an adventure! Until now I kept thinking "I won't mind being one of his scouts" but not this time. Good to see you back safe. It is the trip you will always remember. 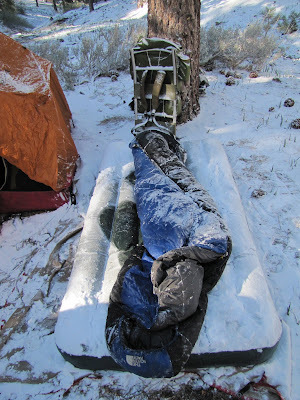 The backpack trip that stands out for me was waking up with a sagging tent & 6" of snow gently sitting on top of all the prickly pear - Sycamore Canyon, Clarkdale, AZ. What a sloggy hike out & then our son's little pickup couldn't get up the hill out of the parking lot. Thank goodness he had chains & actually knew how to put them on. What a beautiful place. The snow probably made it all the more memorable for the boys. Perhaps a silly question, but are you prepared for mountain lions? A local lady on a bicycle was mauled badly on similar terrain here in SoCal a few years ago. A couple of weeks ago a friend & I did some hiking in the Shenandoah National Park in VA. Old Rag was a toughie. Still, it was a very good week. Hiking really brightens your outlook IMHO. If there is a contest for Mr. America, you have my vote. I would also vote for Ms. Nate, because she has to be a big support. But I'm guessing she enjoys having a little free time to relax when you guys are out climbing mountains and stuff. Wow! What an adventure for the boys. a) Nice pictures. Thanks for posting. b) Brr! I think I agree with Ellena.